It has been a quiet-ish first half in the markets, but things could potentially turn volatile now that US investors have come back to their trading desks. At the time of writing, the pound was still lower following this morning’s release of disappointing UK inflation figures, while the US dollar was trading higher against most currencies except the yen. The Japanese currency was outperforming perhaps because of the weakness in the stock market which were coming off their highs following yesterday’s big bounce. Today’s main fundamental event for FX traders is the FOMC meeting minutes which will be published later on and may contain a few surprises. 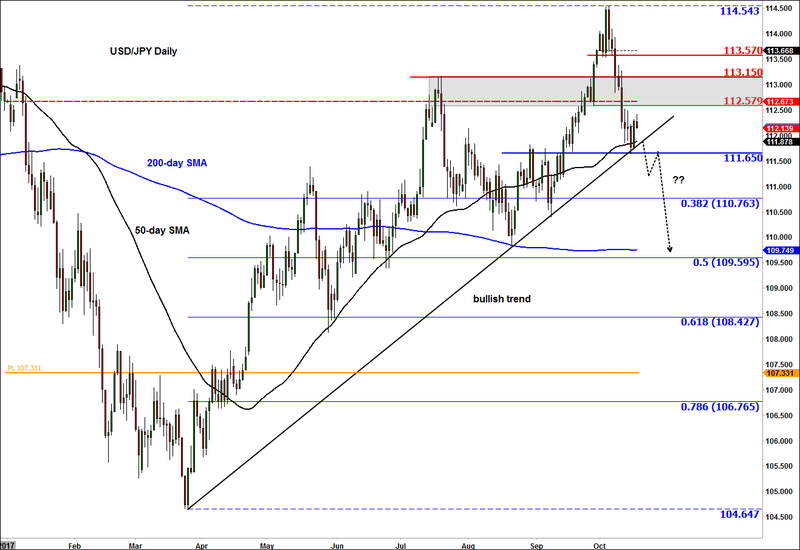 As mentioned, with the prospects of another sell-off in the stock markets still alive, the USD/JPY could be in danger of breaking down amid potential safe haven flows into the yen. Technically, the USD/JPY is looking overall weak because of the fact it couldn’t hold above the pivotal area between 112.58 and 113.15 following its breakout at the end of September. 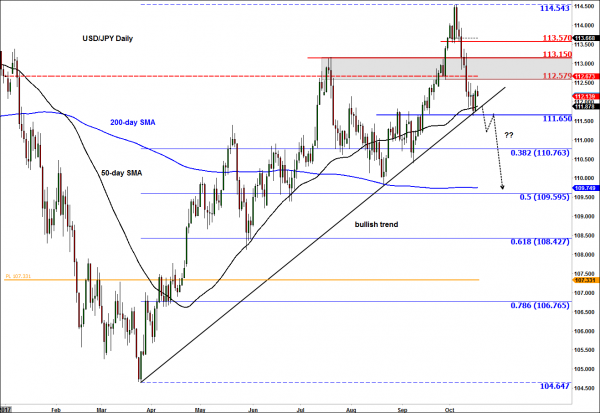 That false breakout has already led to a sizeable downward move, although in recent trade the USD/JPY has found some support off its bullish trend line and 50-day moving average around 111.65-85 area. Thus, going forward, if this area were to break down then we could potentially see a sharp acceleration to the downside. However, if the trend line holds and price eventually reclaims that pivotal 111.65-85 area, then in this case things would look very bullish again.